Big Shoota | Da Big Mek Iz In!!! Da Big Mek Iz In!!! 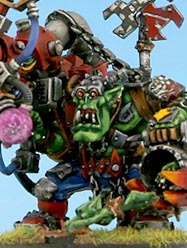 by sukigod on July, 05, 2011 in Uncategorized - Comments Off on Da Big Mek Iz In!!! Ancient hinges, rusted from eons of canadian international pharmacy association viagra, moan their complaints. Sharp screeches of pain puncture the deep rumble as the massive workshop door slowly grinds open, daylight ruining the darkened calm of sleep beyond. Huge, translucent storage containers stacked imperiously high, reaching to the ceiling of the vast factory above. The remains of ruined vehicles and buildings peeking through the clear units. Things of devastation waiting their turn to once again be committed to acts of war. A small aerial navy mothballed in the corner. A mockery of jets, uncompleted, surround a monstrosity of mad genius. Something that surely would never fly, it’s just too big, too cumbersome… too wrong. The smell of old grease, glue and paint permeate the gloom, harkening to a more productive era, when things rolled off the work benches in a continuous, churning stream for battle. Long undisturbed dust motes stir up at the disruption of a long sleep, marking shafts of light through the newly opened door. A series of hazy, glowing arrows pointing at the occupant at the doorway. A figure stands expressionless. Impassioned. Alone. Silhouetted in the murky light cast through the door. A deep rumble emits from the figure, a heavy weight of voice, like that of a lumbering tank rounding the bend.